Original 2004 24 Hours of Le Mans Poster. 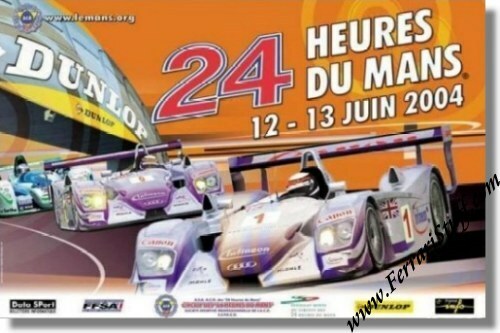 The 2004 Le Mans poster is part of the era in Le Mans posters which is generally described as "The Le Mans Poster in the era of computer graphics and sponsorship" and which lasts from 2001 until the current day. The 2004 24 Heures du Mans poster was produced by the Archimede agency after a color illustration derived from a color photograph by Regis Lefebre. Audi took over from Bentley as the star on this poster and on the podium. The graphics move away from reality towards creativeness. The Dunlop bridge remains the mythic icon of the circuit. The race was won by Seiji Ara, Dindo Capello and Tom Kristensen in their # 5 Audi R8 with a total of 379 laps to their name. For the full results of this race, please see 24 Heures du Mans results 2004.